The Wisconsin uprising has become as loud a wake-up call as there has ever been that working America is under attack. Moves by Governor Scott Walker and the Republican majority to steal away the collective bargaining rights of public sector workers – as a false premise for the state’s budgetary hardships – has triggered a national uproar by labor rights supporters. In spite of all the good organized labor has brought to all American workers – union and non-union alike – union membership in the U.S. has endured constant erosion by the corporate sledge over the past several decades. 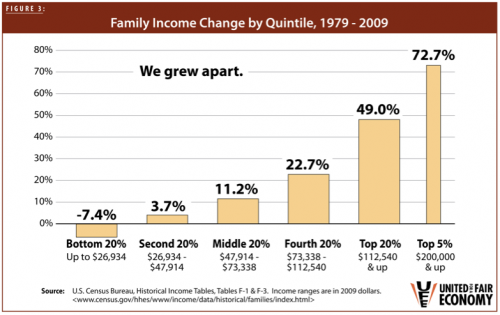 The result has been an economic gulf, separating the rich from everyone else. The top 10 percent of U.S. households own nearly three-fourths of the country’s total wealth; 34 percent is held by the top one percent alone. Some among this very wealthy elite have a profit-lust so insatiable that it’s causing the American middle class to fade from existence, as income stagnates and the unemployment crisis continues. If Governor Walker succeeds in his anti-union crusade, we could face a system-wide shift that would further obscure the voices of average workers. Attacks on collective bargaining are, in essence, attacks on democracy. To dilute the power of unions is to actively support plutocracy, or rule by the wealthy. What too many of us don’t know is who has the most to lose from attacks on organized labor. Unfortunately, the answer shouldn’t come as a surprise. 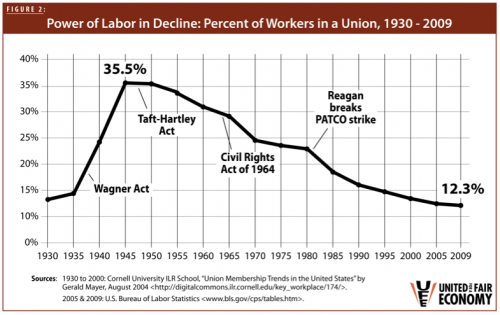 When it comes to organized labor, the public sector has served as a far more reliable foothold than the private sector. The more stringent equal opportunity and civil service protections of the public sector offer more agreeable circumstances for historically disenfranchised workers than private sector jobs. For example, the public sector has offered more opportunities for women and workers of color to achieve income parity with white men. Initiatives such as that of Wisconsin’s Governor to break down public unions will be especially harmful to those who already face a constant battle against workplace discrimination. 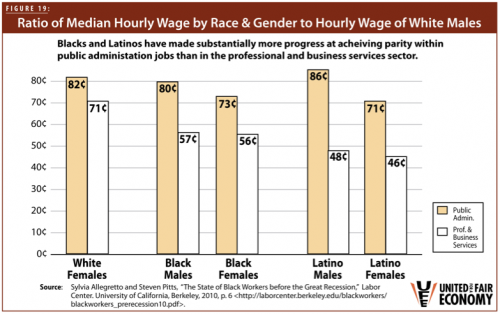 A recent report by United for a Fair Economy emphasizes the vital role of the public sector in providing opportunities to people of color, who are burdened not only with the residual effects of past injustices, but also contemporary barriers to upward economic mobility. Today, Black workers are significantly more likely than the overall workforce to hold government positions. Because of that reality, across-the-board cuts to the federal, state and even local budgets would have particularly ruinous effects on Black workers. If we’re ever to move beyond a jobless recovery, and meaningfully address the disgraceful racial inequality that tars our supposed “civil” society, it is imperative that we preserve the public sector by funding a jobs program that invests in our people and in the longer-term stability of our economy. You can’t fight something with nothing. But as long as Democrats refuse to talk about the almost unprecedented buildup of income, wealth, and power at the top – and the refusal of the super-rich to pay their fair share of the nation’s bills – Republicans will convince people it’s all about government and unions. Nothing could be further from the truth, but for some reason Obama and the Democrats aren’t responding with the truth. Their response is: We agree but you’re going too far. Government employees should give up some more wages and benefits but don’t take away their bargaining rights. Private-sector unionized workers should make more concessions but don’t bust the unions. Non-defense discretionary spending should be cut but don’t cut so much. 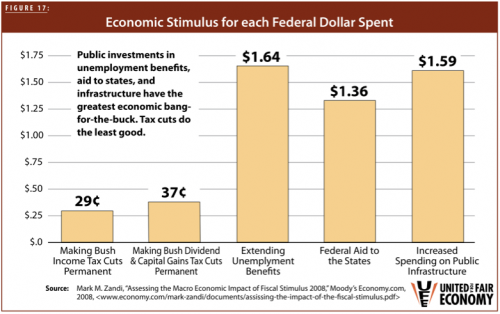 The money for a jobs program and other recovery measures exist, but we’re not tapping the most abundant sources. Let’s demand that corporations stop dashing off-shore to avoid paying their tax tabs. Let’s tax the high-risk, casino-like investing on Wall Street that so heavily contributed to the financial meltdown. Let’s restore progressiveness to the personal tax system by raising taxes on the wealthy, who have reaped the most from our economy and are most able to contribute more without sacrificing their livelihoods. We can raise the top-tier federal income tax rates to their pre-Bush levels (at the very least), and add new brackets for those with remarkably high incomes. We can strengthen the estate tax – a means to prevent the creation of American dynasties and reduce wealth inequality – well beyond its current form. We can bring an end to preferential treatment of investment income – like capital gains and dividends – by taxing it the same as earned income. And, let’s wean the Pentagon – which now accounts for 58 percent of the discretionary federal budget – off of the taxpayers’ proverbial teat by cutting unnecessary defense spending. The revenue generated would be more wisely applied to domestic investments. But, investments should be made using a targeted approach that would address chasms of race and class in the U.S.
We’ll first have to establish a shared agreement about the type of society in which we want to live. Will it be one that encourages greed and inequality, or one that provides essential services and opportunities to all of us? Will it be one that provides access to only the financially enriched, or one that’s truly democratic? Will it continue to pit us against one another, or will it inspire togetherness and community? At its best, the American labor movement has not only fought for its own members, but has campaigned for policies that would benefit us all, like a national health care system, a higher minimum wage, safe workplaces, labor rights and environmental protection. And, while the historical intersections of the civil rights and labor movements haven’t always been flattering, it would be counterproductive to target unions for a legacy of discrimination that belongs to the nation as a whole. We should embrace the real hope that the two movements can find shared purpose, and move forward as a more diverse, inclusive and, most importantly, unified movement. Ironically, It may well be Governor Walker’s outrageous attacks on public employees that ignites the very movement he seeks to destroy, and brings the U.S. toward a more just and egalitarian society.